There are a few factors that could cause your fire detection systems to fail. Because Denver fire alarm systems are our specialty, we are experts at helping local facility managers avoid the common pitfalls that lead to serious fire safety issues. If your fire detection system fails, it could endanger lives and lead to costly repairs. Commercial and industrial buildings in Colorado’s Front Range can’t afford to deal with prolonged shutdowns during fire cleanup. Instead of risking the chance of your system failing, we recommend educating yourself on the reasons a system might fail and putting the proper preventative measures in place. It’s important to check your systems often and ensure none of the following have occurred. Testing your system is important. 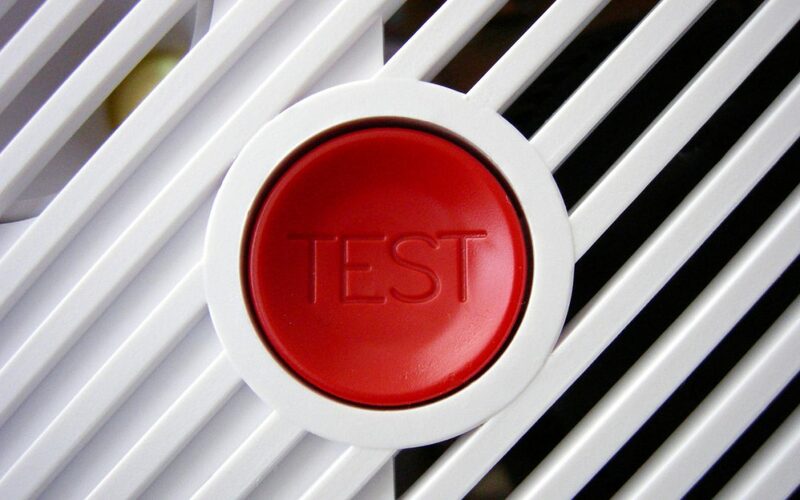 You should test your fire alarm system at least once a month to make sure it’s properly functioning. To test your system just hit the test button on the device. If you have an alarm system that has 10-year batteries in it and the alarm chirps or beeps indicating the battery is low then you should replace the entire device immediately. As simple as it may seem to replace the batteries of your fire detection system, it can easily get overlooked. Generally the system will alert you when the batteries are low with a loud beeping or chirping sound. However, there have been times where people remove the batteries to stop the noise and forget to put new batteries back in. Both dead batteries and no batteries at all can lead to a detrimental situation and put you and your building/home at risk. Smoke alarm systems expire after about 10 years or 87,000 hours of service. If you aren’t sure when your system was replaced last, it’s important to find out or be on the safe side and replace the system. If you are in an older building or home, then it’s crucial to make sure the fire protection systems are up to standards. Check out the NFPA list of codes and standards and have your devices looked at by a professional to ensure they are properly installed and functioning. Having more than one fire protection system in your building, office or home is vital. You never know where the location of a fire will occur so it’s better to come prepared. The location of your fire protection systems should be away from all windows, doors or ducts so drafts don’t interfere with their detection. Another cause of system failure could be a result from paint, stickers or decoration on the device. Make sure the device is clear of anything that could get in the way. Lint, dust, dirt and even insects can tamper with the effectiveness of fire detection systems. After an accumulation of one or all of these contaminants occurs, the sensitivity of the detection device is reduced. Make sure to clean your devices often to ensure they are up to par. If you notice dust buildup or other issues with your device, it never hurts to give it a quick wipe down. Heat rises. That’s a fact many people are aware of. However, as the heat from a fire rises it can also cool, decreasing the detection rate of the fire protection system. Smoke stratification is also a factor, which occurs when buoyancy forces lose momentum before reaching the ceiling. This means the smoke will hover right under the ceiling without setting off the alarm. It’s best to have your fire protection systems located in an accessible area so they can detect fire closer to the source. You can also easily keep up on their maintenance if they’re in closer proximity. Frontier Fire helps facilities all over the Denver area. We are happy to help ensure your fire detection systems are properly working. We can also help you meet all the safety requirements and standards in the Denver area and Colorado Front Range. If you have any questions, please don’t hesitate to contact us.